Once users are running iOS 8 on their iPhone, iPad and Apple TV, they'll be able to share all iTunes account purchases, including apps, music and movies, between up to six people in their family. The new Family Sharing feature in iOS 8 can be enabled by launching the Settings app, choosing iCloud, and then selecting "Set Up Family Sharing." Doing so on the initial device will establish that person and their account as the "Family organizer." Apple's Family Sharing system works by having the organizer and their credit card control purchasing of content on the iTunes Store, App Store, and iBookstore for up to five other people. As long as all users are making purchases with the same credit card, all content purchased separately on different devices can be freely shared with one another. This includes legacy content tied to a separate Apple ID that may have been purchased with a different credit card. After setting up the payment method and adding authorized users, past purchases from other Apple IDs under the Family Sharing umbrella may not appear immediately. In our tests, we had to download content— a free app did the trick —in order to view others' purchases in Apple's three online storefronts. Application developers do need to enable Family Sharing for their content to be available on separate devices. In our tests, content from the iTunes Store and iBookstore was unrestricted. To view and download purchases from other Family Sharing users, find the "Purchased" menu in the App Store, iTunes Store or iBookstore. 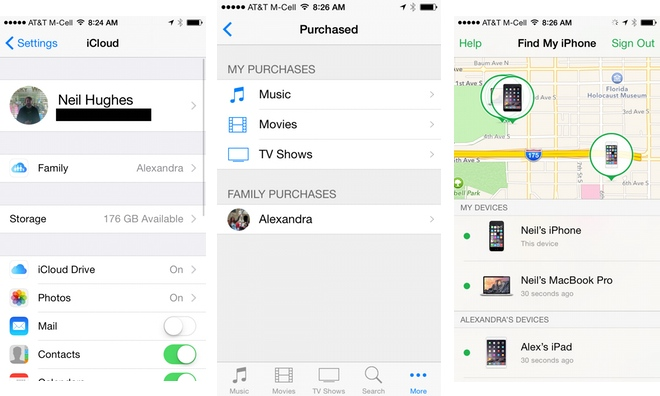 Once there, iOS 8 provides a list of your purchases, as well as "Family Purchases" from other people on the shared account. Family Sharing goes beyond copyrighted content, however. Another feature is easier location sharing, allowing users to track each others' devices with the Find My iPhone app. By default, family members' device locations are shared in Find My iPhone. This can be disabled through the "Share My Location" setting in the iCloud app. The Family organizer can also identify members as a parent or guardian, which authorizes them to approve "Ask to Buy" requests from children in the family. Using Family Sharing, parents can control what apps their kids can buy remotely, accepting or declining attempted transactions from their own iPhone or iPad. Family Sharing also includes a dedicated iCloud Photo Stream for family members. Posting a photo, video or comment to this stream will make it available on all members' devices, and notifications will be sent once someone adds to the stream. 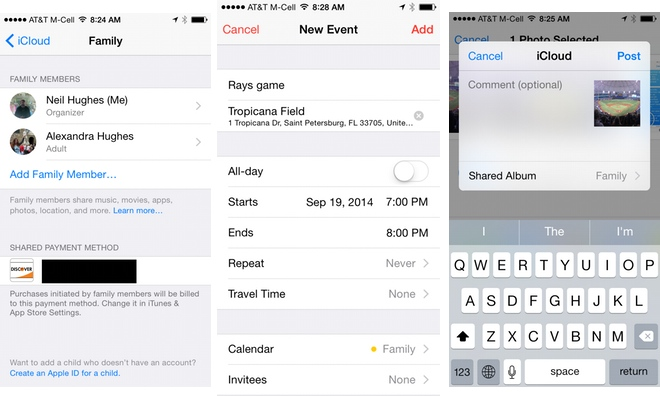 Finally, Family Sharing members also gain access to a new, automatically created "Family" list in the iOS 8 Reminders app. As expected, new items created on this list will be seen on all members' devices.